There have been many ways I have learned from others as a photographer. Beginning with local photography field workshops offered by resident experts in their field allowed me to explore a variety of subjects to discover what I’d be most interested in as a photographer. 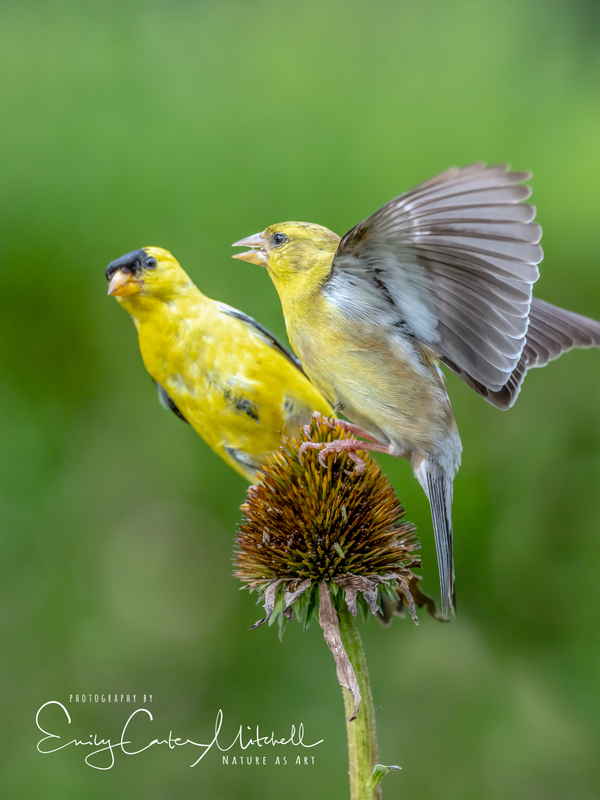 With great fortune, one of the companies I took classes from Capital Photography Center brought me in as the nature and wildlife instructor for the DC, Maryland and Virginia area. It’s been a wonderful experience, and my photography and I have benefited from the many students that have followed me out in the field. Along with field practice with a photo coach at my side, I also took courses at the local community college that had both online and in-class room sessions. As a graduate of one of the oldest standing online colleges – University of Phoenix, I was very comfortable with online learning and discovered a fantastic learning center at Creative Live where a variety of courses are offered and once you purchase the class you retain access to it for a lifetime. What’s fantastic about Creative Live as that you can learn from incredible photographers like Art Wolf and such. As adult learners, we all have different learning styles and understanding what style works best for you helps in mastering the craft in the easiest fashion for you. Some learn by doing. Some learn by reading. Some learn by watching. I never was a good reader of manuals or class text books. I learn by doing. Here is one place you can find out what type of learner you are. Reach out and search for learning in a variety of ways. There are so many wonderful coaches out there that generously share their knowledge. Throughout the wide variety of courses and photo coaches I’ve worked personally with, one thing I did was keep one master notebook with all my notes from each session. I can go back to this book at any time and know that it will have any gems of information I jotted down to refresh my memory. After many years, I finally filled the book and am now working on a new book that now holds course notes along with inspirational ideas for photo projects. School time is just around the corner – go find yourself a lovely notebook that you can easy carry around and make a commitment to yourself that now is the time to invest in yourself. 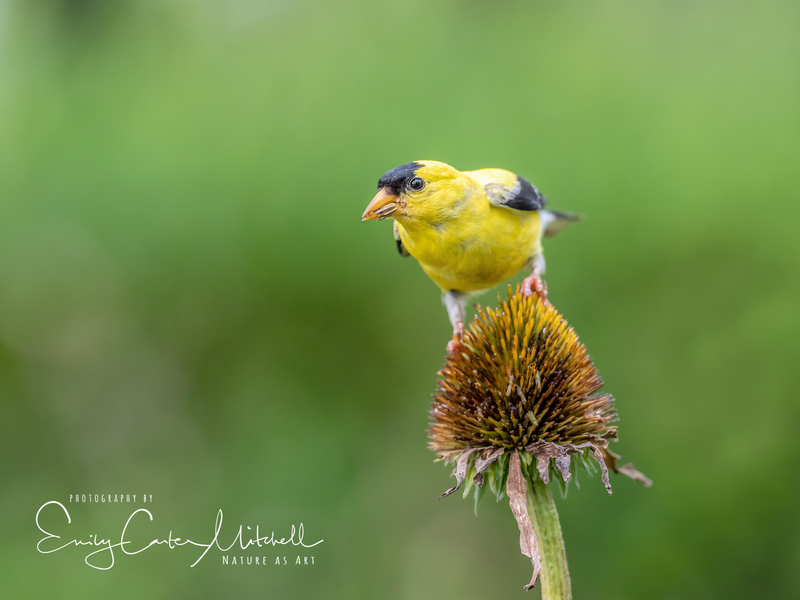 The story behind these images: As every late summer, I wait and wait for the Purple sunflower seeds to emerge and for the goldfinches to land and dine on them. They’ve become more accustomed to my car, but not my physical presence. So this afternoon in the hot humid heat I sat in my car with the window down melting while I waited for the Goldfinches to return. I positioned myself for one specific seed head that I noticed the birds were enjoying more than the others. A beautiful male came in and I got some wonderful captures. Then lo and behold, the Mrs. showed up and at first I was thrilled she was on a nearby flower. Before I knew it, she jumped onto the same flower head the male was and chased him off. These were captured with the Olympus OMD EM1 Mark II with 300mm f/4 (600mm equivalent) at f/4.0, ISO 1000, 1/1250 sec. With the noise at ISO 1000 on this Micro Four-thirds system, I brought the image into the newly introduced Topaz Labs Studio AI Clear Module which offers superb noise reduction and detail restoration. Well worth every penny I’d say. Gorgeous capture, Emily, and so much excellent info in this post! I use the same camera as you, have taken classes from Creatlve Live and learned about Capital Photography this past week and subscribed to their newsletter. Wish I lived in DC so I could take your classes. Are you familiar with 52 Frames? A fellow “framer” wrote about this weekly challenge in the aforementioned newsletter. I think you would love this group! Check it out at 52frames.com. At your suggestion, Emily, I downloaded Topaz Studios and the trial version of AI Clear. It is incredible! I added Topaz as an external editor in LR, and, going forward, running my shots through AI Clear will be my first step in post processing. Thank you! This is super to hear Susan. I was so impressed how well it works. Topaz Studio has so many amazing things in it. Can’t wait until you discover more there. Oh and thank you for mentioning 52 Framers – I was just talking about that today. Thank you! I enjoy tagging along on your adventures. It truly has been quite a journey hasn’t it Rebecca. Big hugs!